February’s Survivor of the Month is a lovely lady named Colleen Robinette. I knew she looked familiar the first time I saw her walk through the door, but I couldn’t place her until after we were done with the photo shoot. Some 10+ years ago, we worked together at the Juliette Gordon Low Birthplace downtown. It was great catching up with her, though I would have rather it not been under these circumstances. I wasn’t aware she’d had breast cancer but am extremely glad that she is a survivor! 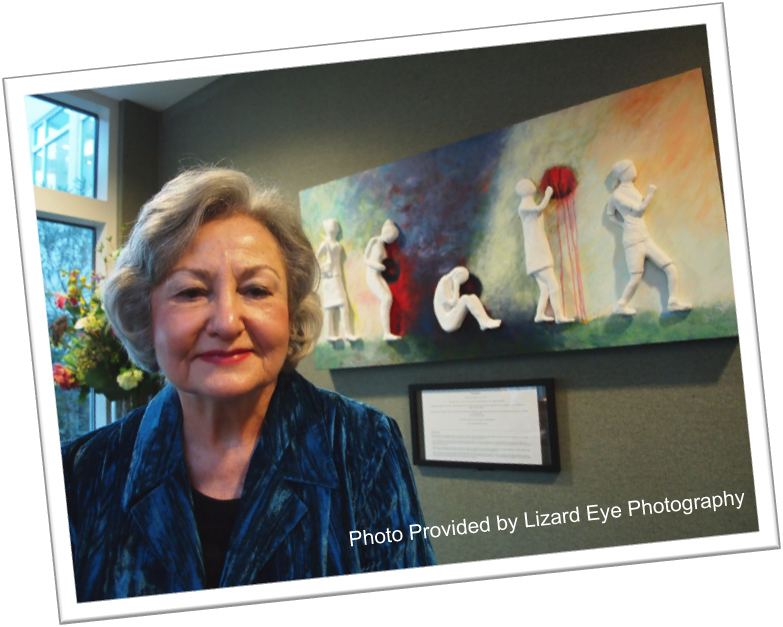 Bright eyed, full of life and dressed in a gorgeous turquoise blue jacket, she posed proudly with the beautiful piece of artwork hanging on the wall in the Curtis and Elizabeth Anderson Cancer Institute at Memorial University Medical Center. The piece was amazing, but we’ll get to that later. Colleen was diagnosed with breast cancer in 2007. She had surgery followed by chemo and radiation and has been cancer-free now for over four years. Prior to receiving the diagnosis of breast cancer, life was good, balanced and in control. “Then, I heard the words “it’s cancer.” Sinking into anguish and disbelief, the questions arose….what would happen to me? How would I manage? How would the family manage? I was distraught and felt helpless,” she says of her diagnosis. “Drawing on inner strength, the hard work began. With faith, supportive family and friends and with the help of an expert and caring medical team, the fear of cancer began to fade and I realized it was not a death sentence. The work of reinvention, rejuvenation and rebirth began. Life was changed…but life was still good,” Colleen says of her journey through. Colleen believes that early detection and treatment are the best steps for a successful outcome. Her advice for others is: Those diagnosed need to be proactive in their care by asking questions and actively partnering with their healthcare team. In addition, they should discuss with their healthcare team what complementary care such as acupuncture, exercise (yoga, meditation), and nutrition would help during and after treatment. I found that Susan G. Komen for the Cure and other reliable organizations were good resources for information on topics related to nutrition and exercise. As part of her recovery, she chose to create art. In 2010, she submitted her first painting entitled “The Big C” to a traveling art exhibition called “Oncology on Canvas.” It has been on tour around the country for the last year. Then in 2011, she donated her second work entitled, “The Journey,” to the Curtis and Elizabeth Anderson Cancer Institute at Memorial University Medical Center where I received my treatment. “ It depicts a woman on her emotional and transformational journey with breast cancer. The piece was given in gratitude and appreciation to the physicians, nurses, and entire staff who are dedicated to obtaining the best possible outcome and to walking the journey with each person who seeks their care. It is displayed in the main lobby at the Institute,” Colleen says of her piece. And she’s absolutely right. It is very narrative and easy to understand but conveys a deep emotion to it….displaying the ups and downs that come with cancer. Colleen thinks it is important to raise awareness about breast cancer, especially among young women. As both a survivor and a retired women’s health nurse practitioner, she finds herself speaking often to women about breast cancer and would like to speak to women’s groups in the future. I’m so glad I was reunited with Colleen and am even more glad to find out that she’s doing so well and is stronger than ever!